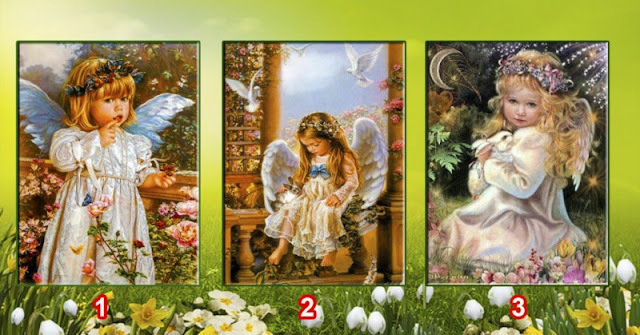 Choose An Angel And Find Out What Will Happen To You In The Near Future! Pick on Angel and receive your message. If you want to know what message your Angel has for you, just look at the picture and choose the one you like the most. So, if you like the first angel, most likely there will be a bright period in your life. Very likely soon you will receive a long-awaited gift. You can feel a surge of energy and spiritual inspiration. Those who chose the second angel, be ready for a meeting that you did not expect. It can be a person or an event that will bring a lot of positive impressions. Believe in yourself, and your dreams will come true. If you like the third angel, in this case, expect success in the financial plan. Higher forces will help make the right choice. Remember: any events will lead to a positive result.